Starting in the early 1970’s as a manufacturer of industrial magnets, today we are the largest supplier of professional grade magnetic sweepers in the United States and one of the leading suppliers of industrial magnets worldwide. Our first client, “Consolidated Freightways” purchased the “Original” Type ALT magnetic sweeper back in the early 1970’s and went on to use our sweepers throughout their system. Shields Magnetics now caters to clients all over the world, from Europe to the Middle East and maintains a dealer network of over 2500 dealers and distributors as well as making one-click ordering available below. Utilizing state-of-the-art technology and the most advanced materials available, Shields magnetic sweepers are innovative, functional, and effective. Our entire line of sweepers carries a lifetime guarantee on strength and a full product performance guarantee. All of our industrial magnets originate in the USA. 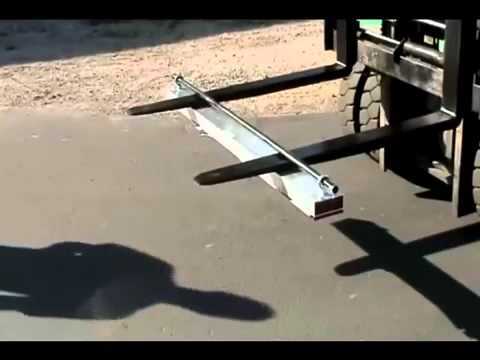 Need a magnetic sweeper that can be mounted on a vehicle or forklift? Our Type ALT is the first model of magnetic sweeper ever produced and continues to be the industry standard. The Type ALT helps to reduce maintenance costs and eliminate flat tires by more than 70 percent at airport terminals, loading docks and industrial work sites. They also eliminate dangerous ferrous metal debris while service your vehicles perform daily duties. Our patented auto- release design allows easy and safe debris removal. A simple and effective operation, debris is release from the hinged aluminum collector plate at your convenience. Bottom mounted wear -bars protect both the hinge/collector plate and the FOD magnet from any hazards. Need a multi-purpose magnetic sweeper than function as a push sweeper or be mounted to forklifts or vehicles? Look no further than the dual-purpose Terminator, our heavy-duty magnetic push sweeper converts easily to mount on forklifts or suspended from bumpers so you can handle any clean-ups of any size. Perfect for businesses that need to quickly remove debris from almost any type of surface — grass, gravel or broken concrete –, but that also need a solution for larger material containment problems, such as parking lots or airfields. Designed for use on uneven, rough terrain, the Load Release All-Terrain Magnetic Sweeper is ideal for use on gravel, dirt, broken concrete and unconventional surfaces. Inside each magnetic sweeper are powerful ceramic magnets, which are protected by an aircraft-grade aluminum housing. Need something even more powerful to pick up heavy debris? 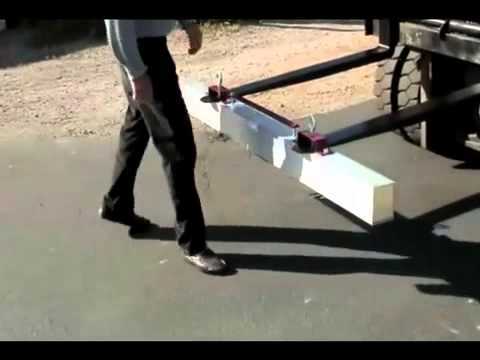 Our Enforcer Forklift Magnet is the most powerful forklift magnet available on the market. With more than 200 lbs. 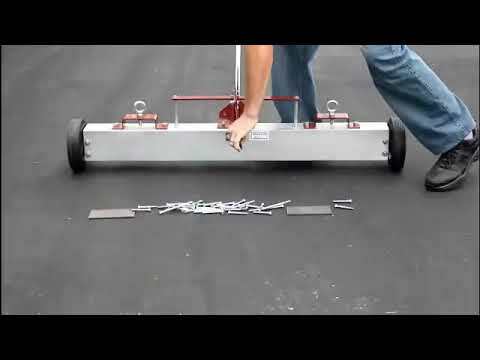 per foot of lifting power, this magnetic sweeper removes massive amounts of nails, screws, bolts, tin, and other damaging debris from worksites. I don’t know what magnetic sweeper I need. Where are your magnetic sweepers made? A. In the USA! We are one of the only manufacturers of magnetic sweepers in the U.S, the rest come from outside the U.S.
Can these be put on the forks of a forklift? A. Absolutely, if a specific model does not have fork pockets on it, we can put them on. 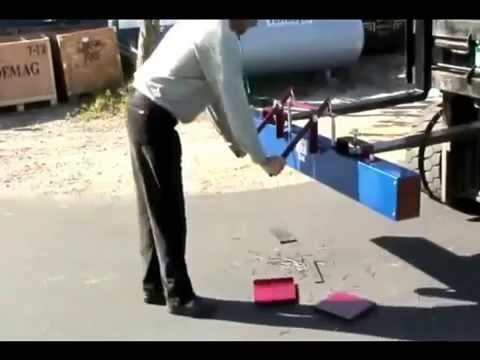 How do I hang a magnetic sweeper from a forklift? A. Most users either mount it on the counterweight with self-adhesive hooks or tap and drill the counterweight and suspend chain through the holes. The magnets can also be hung under the center in some cases. Do your magnetic sweepers work on all vehicles? 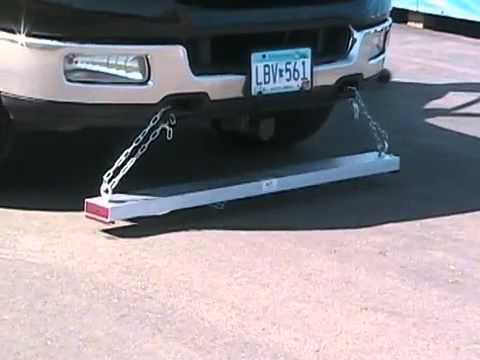 Yes, you can mount them to any type of vehicle via the attached eyebolts. We supply the suspension chain if needed. What is the necessary suspension height? We suggest within 4” of the ground, although the closer the better. Traveling speed should not exceed 15 mph. No, all of our sweepers are constructed of aircraft grade Aluminum Extrusions and the Permanent Ceramic Magnets are housed inside. How do you clean these? We have several models with self-cleaning features. If you don’t see the one that suits you, please call us and we’ll guide you to the proper model. Do the magnets ever lose their strength? Technically they lose .01% of their strength every 100 years, so essentially “no”. These are Grade 8 Permanent Magnets. Can you use these underwater? Yes, water does not affect them.